We provide bond cleaning services/end of lease cleaning, carpet steam cleaning and pest control/flea control services at pocket friendly price. We also provide 7 days of job guarantee with our services. We are known for our best quality in Brisbane. 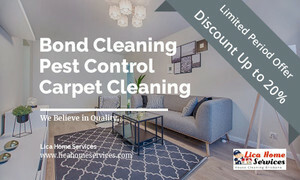 Choose Lica Home Services Brisbane to book your bond cleaning services and get upto 15% of discount.